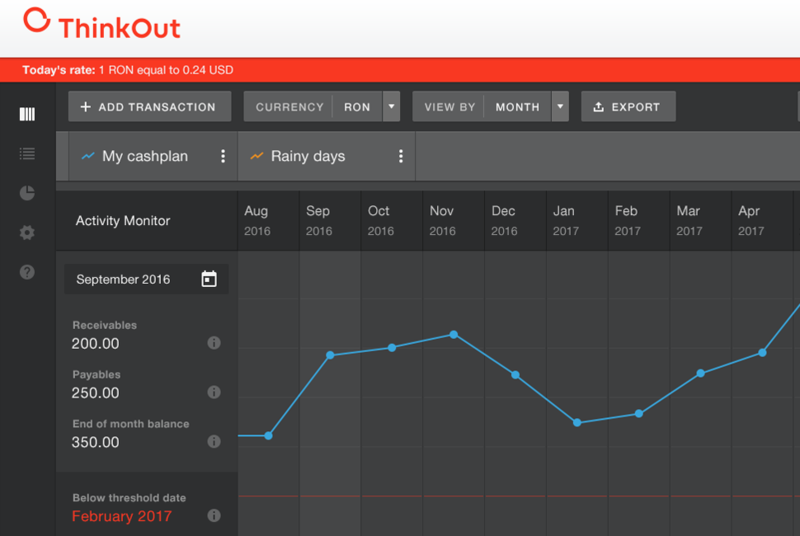 One of the main features of the ThinkOut platform is the possibility to build and compare cash flow scenarios. For those more familiar with cash flow forecasting, it may be clear. Still, some of you may be just discovering the wonders of financially planning ahead operations and it could sound a bit discouraging. Not to worry, below we’ll walk you through how to deal with scenarios when using ThinkOut; fast and painless, promise! First things first, what is a scenario? In our case, it’s a plan comprising expected revenue streams and expenses for the near future; we’re talking about the cash plan. When you first start with ThinkOut, you build the cash plan of the current business situation; its purpose is to track the cash movements of which you are rather certain. Why the need of scenarios (additional cash plans)? Because you may want to test some business hypothesis, see what happens when you decide one way or another. Say you notice that the expenses are larger than the anticipated income in the current cash plan and cash is running out pretty soon. Something needs to be done, so you start weighing options: reduce office or utility costs (such as rent, equipment, phone), win another client or start selling a product. At this point, things may still seem unclear, not sure where they lead; but put these ideas into numbers in a scenario and see for yourself how the cash flow evolves. So this is why you need to build a new cash plan. Don’t worry, you won’t start all over. In your ThinkOut account just click the + button at the right upper corner of the cash plan and there you have – the Add Scenario window. There is a list of all the existing groups and categories in the original plan and you just need to uncheck the ones that you no longer need. Click Create and you have a new cash flow scenario. Once it is created, start adding new categories, according to your hypothesis. You’ll get to see right away how the balance fluctuates in the graphic above, in relation to the threshold line that you set in the beginning. If one scenario is not enough to make things clear, create another one. The usual practice is to work with a Best Case and a Worst Case scenario. Building them is the first step. In order to make a decision, you need to compare scenarios and see which one best suits the business goals and what are the decisions you need to take: which costs to cut? how much can you afford to invest in marketing? hire or outsource? The comparison can be done at a glimpse, literally. Graphics for each scenario are displayed simultaneously in the upper part of the cash plan; it shows clearly which one keeps the business above the threshold line and for how long. You can even take a deeper look at each scenario in the Analytics section where you’ll discover how income and expenses are distributed each month and which ones weigh more. It will be easier to figure out where most of the money goes and which revenue stream is more efficient. If you’d like to learn more, just drop us a line at office@thinkout.io or talk to us on our social media accounts; we’ll be happy to have a chat and assist you.